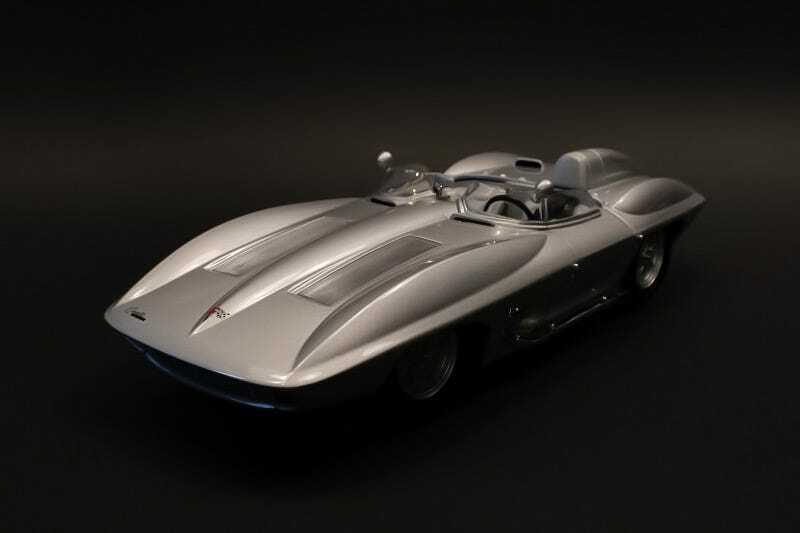 This is the AutoArt 1/18 scale Corvette Stingray prototype racer. Dramatically dark pictures for the introduction! This was an experimental racer designed to test a new 4-speed transmission, the use of aluminum, and a follow up to the ‘57 Corvette SS. After winning a national championship in 1960, it was retired and sentenced to life as a show car. Obviously, this car heavily influence the legendary C2 Corvette, the second generation that debuted in 1963. The low, long, and wide hood, the hidden headlamps, the side exit exhaust, all cues taken from the Stingray. The huge front clam-shell opens skyward to reveal the 283cu inch V8. Real wire screens provide a sneak peak. The engine bay is as incredible as you’d expect. Wiring, hose clamps, grooves on the air box cover; everything you’d image to be in full AutoArt detail under the hood. Even the racing spec headlamps hidden behind the grille are accounted for. The rear hatch opens to reveal the fuel tank and the racing spare, which is secured with tie-downs. The cockpit is fantastically detailed. There are chrome bezels around the gauges and a grip on the shifter. The safety harness features warning labels on the shoulder straps. The passenger seat was actually added to the car by GM after its racing days were over, which is why you won’t find a safety harness over there. Everything that should open, does. The steering wheel turns the wheels, but the suspension is static. As for details around the exterior, legendary stingray emblems are tagged on both front fenders. AutoArt even dis-colored the chrome exhaust to mimic the effects of intense heat. Mock hood latches are non-function, but are correctly accounted for. Badges around the car are correct, from the flying flags on the hood to the Corvette script on the license plate.